This week I am going to share the end to Harriette’s year of isolation. What happened at the end of her year of saving herself for Lord Worcester’s return? But before I tell you, as usual, here’s a recap for people joining this series of posts today, and if you’ve read it, skip to the end of the italics. Harriette tells us that at the end of her year in the countryside, she is still receiving letters from Lord Worcester who his very excited that the year is nearly up and ready to pack and leave for home immediately, while Mr Meyler is also still writing to her hoping Lord Worcester will not come home. But then when the end is nigh… Lord Worcester writes to say his regiment has been posted to Spain and he cannot come back, but he instead asks Harriette to go to him. Dutifully, and perhaps still with the idea of one day being a duchess, she tells the women she has been living with in Charmouth that she must leave immediately for Falmouth as she has to go to Spain. (I have to say this whole piece of Harriette’s memoirs sounds a little tongue in cheek, but I’ll share it as she does). 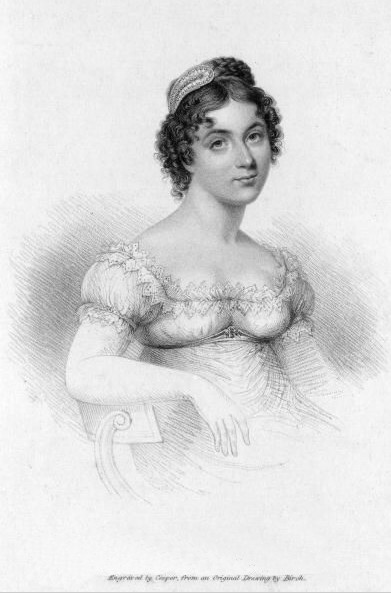 Well when she announces this, one of the older woman in the house, Eliza’s Aunt Martha, who Harriette has begun calling her own Aunt Martha, cannot stand the idea of letting Harriette travel alone, and while she will not travel to Spain with her, insists she may at least travel with her to Falmouth and see her on to a ship. So having done an overnight sewing repair to Aunt Martha’s Calico Habit, so she is dressed to travel, Harriette sets off with this woman on the mail-coach to Falmouth. When they arrive Harriette tells us there are hardly any rooms in the inns because the weather has been too bad for ships to sail to Spain and so the inns are full and they are confined in a small ‘garret’ room with no sight of a maid or waiter, or even a bell to call for one. But within their inn, is a some sort of official, ‘a Consul or an Ambassador’ waiting to travel to Spain, and he of course has the best rooms, and Harriette of course happens to have made his acquaintance in London, so earns herself an invitation to dine with him. She says that she whispers to him asking him not to reveal to her Aunt Martha, who exactly she is, and nor to mention Lord Worcester to her, as Aunt Martha believes her married to a soldier. For a couple of weeks they live in the inn, and share their meals with the official and his senior officers, and Harriette comments on a lack of letters from Lord Worcester, believing they would have been forwarded from Charmouth if received. But then a young officer arrives from the Army’s headquarters and Harriette takes the opportunity to ask the man if he knows Lord Worcester, or has heard anything of him – well actually – Yes, he has. Harriette asks if the young officer was certain, but admits she was not that distressed by the tale (although I have to say her response implies a little distress). So that was an end to any hopes of becoming Lord Worcester’s duchess when he inherited from his father and became a duke, and any thought of languishing anymore in the countryside. Harriette says that she also heard before she left Falmouth, that there was a rumour if she travelled to Lisbon, the Duke of Beaufort, Lord Worcester’s father, had a plan to have her put on a ship to America. It was definitely decided then, Harriette told Aunt Martha that she’d received a letter which meant she must go to London, and duly travelling back past Charmouth, Harriette dropped Aunt Martha off and said her goodbyes to the family she’d lived with for a year. Then immediately got back on the mail-coach and carried on to London. Posted on November 18, 2013 by janelark •	This entry was posted in Regency Stories, Scandalous Women and tagged 1800s, 19th Century, Courtesans, Harriette Wilson, Historic Memoirs, Historical Memoirs, Historical Novels, Historical Romance, history, Jane Lark, novels, passionate, regency, regency books, Romance, writing. Bookmark the permalink.